The Smooth CE 9.5 elliptical is the next model up from the 9.0 elliptical from Smooth Fitness and it has some great additional features in comparison to the early model for a very similar price tag. This trainer is designed for use in gyms or health clubs but it can easily double up as a home workout machine, the design is built to last and has a very sturdy frame to allow it to continue working for many years. It has an increased stride length which can be adjusted from 19-25 inches to incoroparte changes in your training session or to accommodate people of different sizes. This particular model comes with a DOT matrix display with a huge selection of workout programs to target any goals you can be working towards. Also it includes the mySmooth Virtual Fitness Trainer to keep you motivated and with Bluetooth connectivity it extends the function to imagine working out anywhere in the world at the touch of a button. UPDATE: The Smooth CE 9.5 is an older model that is no longer being sold. You can check out our list of the best ellipticals $1000-$2000 for a comparable machine. The reviews on the Smooth CE 9.5 elliptical remain in the most part positive as this commercial grade trainer does everything it is supposed to for the general population looking for a casual workout machine. The users find its sturdiness particularly supportive when switching between family members and they like the adjustable stride length which makes it suitable for both parents and children to use. The variance in the workout programs and resistance settings also make it great for adjusting the target or goal for each session. The wireless heart rate monitor makes it easy to stay on top of the intensity. Most reviewers find the very long warranty an excellent bonus but similar to the 9.0 Smooth elliptical it is very heavy and has a large footprint. 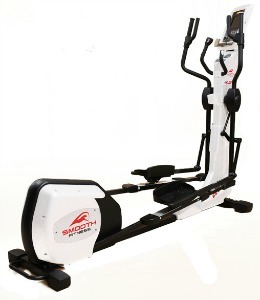 The Smooth CE 9.5 elliptical is a great commercial trainer but similar to its predecessor we believe its footprint and weight make it more suited to the gym floor than the home. 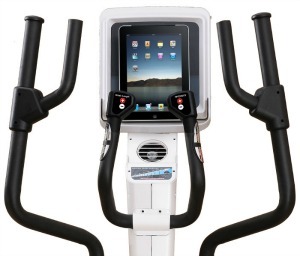 However, if you have the space to set this up it would be a great addition to your garage or home gym. The fantastic warranty is an indicator Smooth Fitness stands behind this model and it should last you a very long time.